NAFED members enjoy valuable print and digital publications sharing the latest on the fire equipment distribution industry. Archives are available to members who are logged into the website. 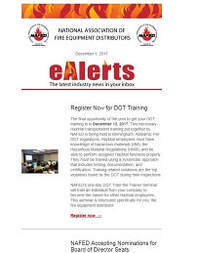 NAFED’s quarterly magazine is the definitive source for fire equipment distributors, covering technical topics and best business practices. ​industry news in their inbox. A printed guide to help NAFED members find a company that provides the products and services they need.